Knowledge Management (KM) is opted as strategic tool by executives to keep their team motivated. These teams consist of employees who have higher level of inspiration and competency. In modern era, worker turnover rate is crucial issue for businesses to attain competitive advantage. Employee’s retention can be measured by their level of motivation and task orientation in work environment. No organization can compromise for loss of skilled employee because it is much essential than any other source of development. The KM is platform that supports strategic business decisions with people, process, and technology aspects. It is widely believed that job satisfaction is wholly dependent upon leadership integrity and justified processes of decisions within organization. Thus, intelligence has been a significant factor in managing human capital. It covers all aspects of customer, competitor, markets, technological and environmental intelligence. Business Intelligence (BI) is process that generates valuable information with DSS (Decision Support System), data mining and advanced analytics for corporate strategic decisions. It is constant approach for creating and enriching significant information in the managerial context. For knowledge based organizations BI is considered as backbone in organizational structure. It turns data into actionable intelligence for executives to make strategies for work environment stability. Business are keen interested to use latest technology for meeting external and internal competition. BI adopts an effective aid to intelligence practitioners for realizing complete picture of resources in form of humans. Many past studies have verified that utilizing high association work practices “can boost firm competitiveness”. Competitive advantage on the basis of employees is the most focused strategic goal for firms. Executive do believe that it is not so easy to imitate human mind. Skills and abilities take time to reach to a stage where employee’s intellectual worth even crosses tangible assets. Within firms, KM is the heart of progression planning. Businesses that properly manage the alteration of new employees by replacing old ones allow job and industrial information to be transferred through the organization to ensure that such particulars are not lost. Either employees leave organization voluntarily or involuntarily. Certain business concerns included complexity, references to the increasing pace of change, globalization, information flow, economy, networking and proactively. Massive development in the information technology and communications demand to adopt BI applications in order to deal with business mechanisms, staying at the marketplace, rivalry, customer control, and retention. What is the relationship between business intelligence, knowledge management, and employee retention in organizational context? How business intelligence ensure to reduce employees turnover rate? How business intelligence empowering the knowledge? To what extent are BI and KM being used in influencing retention and increase competitiveness? How does Business intelligence control internal and external operations in competitive environment? 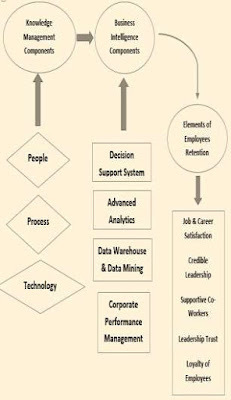 How efficiently Knowledge management build relation between employee and workplace? With superior tools of BI, now employees can also easily convert their business information via the systematic intelligence to solve many business issues with technological advancement. In the light of multiple views and arguments, the model is proposed for KM and BI integration. Open ended questions facilitated individuals to openly share their views. For this empirical research, qualitative research technique is practiced for collection of adequate facts and figures. It included secondary data of selfinterviews to executives and managers in corporate sector, evaluation of existing literature and comparison with previous, past researches, journal, and articles and proposed models of BI to empowering KM. Employee’s feedback is also considered by secondary data resources while analyzing corporate practical strategies. Past data is also preferred as proof to their performance management activities within organization as financial reports, market share and customer service data bases. All those data are collected trough secondary data for this paper purposes.